So-called Islamic State (IS) says it carried out a car bomb attack that killed at least 17 people in the central Iraqi town of Khalis. The explosion, about 49 miles (80km) north-east of the capital, Baghdad, was "very strong" a provincial official told a private TV station. Hospital sources said the death toll was expected to rise, Reuters reports. The blast comes a day after IS said it was behind a suicide bomb attack on a security checkpoint in Baghdad. At least 20 people were killed in Sunday's attack. Khalis is a predominately Shia town about eight miles north of Baquba, the main city of Diyala province. In recent months, IS has lost control of some major towns and cities it seized in Iraq in 2014 and has stepped up suicide attacks in apparent response. The militant group follows an extreme form of Sunni Islam and often targets Shia Muslims, who it regards as apostates. A security source told the BBC that 22 people had also been injured in the explosion on Monday morning at a checkpoint about two miles west of Khalis town centre. A police officer at the scene said a suicide car bomber was responsible. "We still have charred bodies inside many vehicles including a minibus packed with women and children," the captain told Reuters. 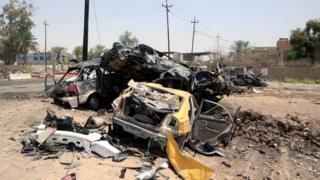 Adi al-Khadran, the representative of Diyala province, told the private al-Sumaria TV that several vehicles had been set ablaze in the blast.